Good morning! How's your weekend so far? I hope you are having a nice time. Me and my sweetie are moving in summent so we went to check one apartment earlier. It's not bad, but we still want to check some others before we make the final decision. We are not in a hurry to move (we are not moving before July/August), so we can take our time with the "hunt". Other than that I just found out my card was featured at Yumi and Fumi handmade blog. Yay! :D And look at the fabby badge we got for being featured. Isn't it awesome?! Thank you ladies! 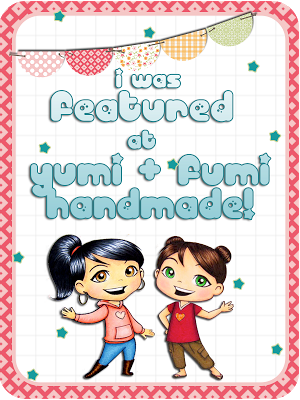 *hugs* If you don't know, there's a fun event going on at Yumi and fumi blog too and you can win some yummy prizes. So why not check it out? Click here for more info. If you don't know, my sweetie is a teacher in elementary school - he currently teaches third-grades (meaning: kids that are 8 years old). Kids in elementary school are encouraged to do a lot of reading and one girl in his class was really good, so he asked me if I could make a little something for her. I immediately thought about bookmark - seems appropriate for someone who likes to read and does a lot of reading, doesn't it? I didn't want to make a "traditional" bookmars, so I made the corner one. And while I had my crafting supplies out I also made a matching pocket card. Here's how the pocket card looks when it's closed. I used the Dress up Marci stamp from La-La Land Crafts. I absolutely love this image. Isn't Marci just too cute?! And I remember I loved playing dress up when I was a little girl so I thought this image would be perfect for an 8-year-old. I raised Marci on foam pads. I colored her with Promarkers and I used TH spun sugar DI on her cheeks. For the necklace I used Viva decor pearl pen and I also added some glitter glue on the flower and on the green parts of Marci's dress (you can see this if you enlarge the picture). I used the flower myself - I used TH tattered florals die and then added a gold brad for the center. The scalloped oval behind Marci was embossed with cottage floral embossing folder.I used TH Vintage market die for the letters. The beautiful butterfly paper is from Studio Light. Here's the opened card with the bookmark inside. And here's the opened card when you take the bookmark out. I kept the bookmark pretty simple. I just covered it with the patterned paper and added some lace on the bottom, some more embossed paper and the white butterfly which is a Spellbinders die. This is such a fabulous gift for the little girl you mentioned. I totally love the color theme you chose and the DP is just gorgeous, not to mention your La La girl is beautifully colored. Have a wonderful weekend and good luck on our house hunting! Amazing idea! What a wonderful card and bookmark! This is so adorable!!! I just love it. So cute. Oh my this is sooo cute Cebelica! I love the colors and all the girly parts. hehehe. She's gonna love it! Thanks so much for spreading the love!! You're awesome!! Thanks again for joining us at Y&FH and creating this awesome multiple fold card for our challenge! Gorgeous flower! such a beautiful card! Thanks for joining us this week at Creative Card Crew! Beautiful card Cebelica, love the sweet image and pretty design. Gorgeous bookmark too. Wow it looks fab !! What a pretty card! I love that image & that gorgeous flower! Very nice work Hun!!! Thanks so much for visiting my blog & leaving such a nice comment! It's very much appreciated!!! Oh Cebelica this is absolutely beautiful I love that image of Marci also the wonderful colours, papers and the inside holds so much magic.